This is Sandusky's original theme park. Originally the Great Bear Lodge, this cozy resort opened years before Castaway Bay and Kalahari Sandusky set up camp just a couple of miles away. Yes, the park is just a few miles away from the roller coaster haven of Cedar Point. What have we got inside? 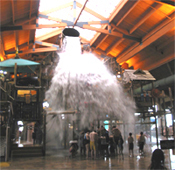 Well, how about 9 slides, 5 pools, a pair of tube slides -- Alberta Falls -- covering 626 feet, a lazy river and many more areas of interactive, watery fun.